You know your love is true when you can play harmless pranks on each other. This time, Jennifer Aniston got help from Jimmy Kimmel to prank her husband, Justin Theroux, and the prank itself? Actually kind of flattering. The key elements of the prank happened while Theroux was in Texas for a friend’s bachelor party. 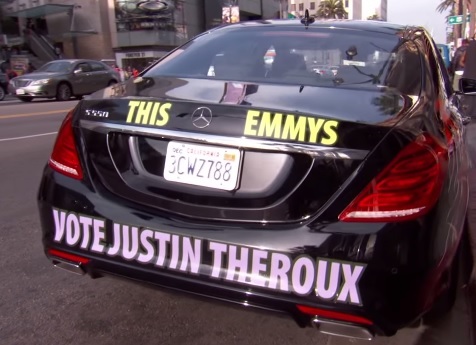 Prior to, Theroux got a recall notice for his black Mercedes. That was, actually, just a ploy in order to gain access (and keys) to the vehicle. Instead, Kimmel and Aniston decided to deck the car out in promotional material for his HBO show The Leftovers. In Kimmel’s eyes, the network wasn’t doing a proper job promoting it, especially with the Emmy Awards coming up in September. Theroux only became aware of the prank while serving as a guest on Jimmy Kimmel Live. His reaction? Priceless. Theroux seemed a little nervous during the segment, but luckily had a sense of humor after seeing what his car turned into. Not like anyone would ever have trouble spotting a Mercedes, but — this redesign is sure to grab some attention. “Justin Time For The Emmy Nominations” indeed. Well played, Kimmel. The Leftovers is currently in the middle of its third season on HBO. You can catch it on Sunday nights.